The Gornergratbahn (GGB) is a nine-kilometre metre-gauge mountain rack railway, with Abt rack system. It leads from Zermatt, Switzerland (1,604 m/5,262 ft), up to the Gornergrat (3,089 m/10,135 ft). 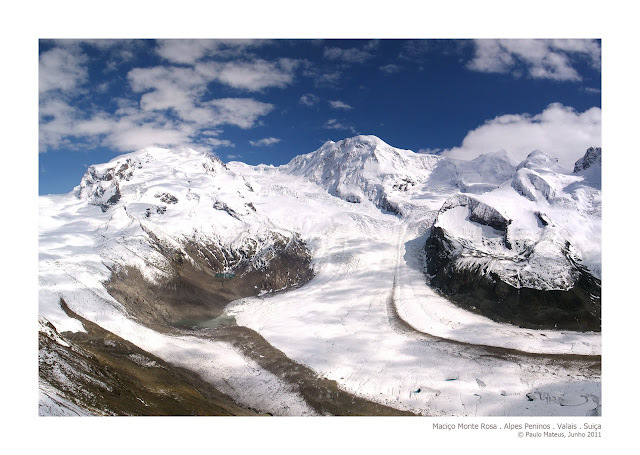 The Gornergrat is a starting point for many hikes, as it lies surrounded by 29 peaks rising above 4,000 m (13,123 ft) in the Alps and several glaciers, including the Gorner Glacier (which is billed as the second longest glacier in the Alps). At the end of the line on Gornergrat, the Matterhorn is visible on a clear day. It is also a popular skiing area. The Gornergrat (English: Gorner Ridge) is a ridge of the Pennine Alps, Switzerland, overlooking the Gorner Glacier to the south. It is located about three kilometers east of Zermatt in the Swiss canton of Valais. The Gornergrat is located between the Gornergletscher and Findelgletscher and offers a view of more than 20 four thousand metre peaks, whose highest are Monte Rosa, Lyskamm, Matterhorn, Dom and Weisshorn.